A bottle of Pocari Sweat would really hit the spot while waiting for the Catbus. 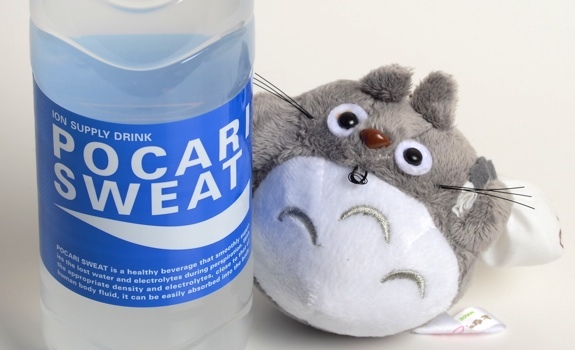 I first learned of Pocari Sweat years ago on an “Engrish” website that documents the curious translations and names that appear on products in places like Japan. The premise of the joke, in this case, is that “Sweat” isn’t a great name for a beverage of any kind. But I didn’t find the joke all that funny. It was a testament to the painfully literal nature of so much translation, as well as a cute example of how humans are remarkably squeamish about their bodies. So, in fact, Pocari Sweat is beautifully literal in the same way that Gatorade is deliberately vague. The Pocari Sweat copy displays an innocent earnestness that is counter to the Canadian/American/British desire to use the English language to avoid talking directly about how food acts in the body. “Refreshing! Thirst-quenching! Hyrdate! Refuel!”? Sure. “Human body fluid”? Uhhh, good luck pitching those words to a U.S. sports drink manufacturer. I first gave in to curiosity and tried Pocari Sweat years ago on a trip to Hawaii (last I checked, it’s available at ABC Stores around tourist areas), but I thought I’d give it another try to refresh my memory. The label is basic white type on a blue background, and the clear bottle shows the liquid inside to be clear with a cloudy white tint. It’s not carbonated, and the mouthfeel is thick and slick. The taste is lightly grapefruit citrus, with both some salt and a small amount of sweetness. It’s simple and refreshing, and it doesn’t taste like a flat, salty soft drink – the reason I shy away from other sports drinks. It’s a good, if unremarkable, beverage for folks who aren’t afraid to work up a sweat on the Wii Fit. I like it just fine. Cost: $3.79 for a 500 mL bottle at T&T Supermarket at West Edmonton Mall. Value for cash money: Not good. It’s very pricey for a basic energy drink. I know it’s shipped from Japan, but there are lots of tins of juice shipped just as far that only cost a dollar. Availability: Not easy to find locally. Check Asian grocery stores. Nutrition? : Per 500 mL bottle: 140 calories. Not much else there. There are 32 grams of sugars per bottle, and 240 mg of sodium. The verdict: Unique, but good. It sure is expensive for what it is, though. Would be nice if there was a side by side nutrition comparison for Pocari Sweat and Gatorade. Something very clear and concise. I’m a big fan of pocari sweat and frequently purchase on my trips to Japan. Asian markets are definitely the place to find these, but at about $2.50 for 16.9oz! !